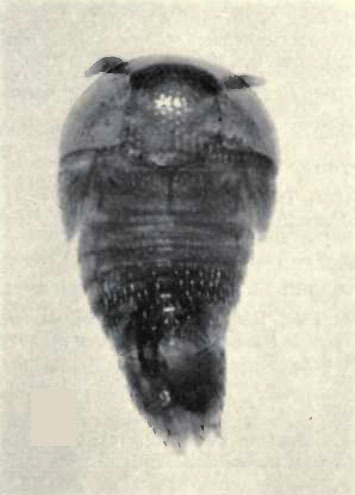 Termitodiscus heimi, from Seevers (1957). The Termitodiscini are a group of minute limuloid staphylinid beetles found in association with fungus-growing termites in Africa and Asia (Seevers 1957). Characters (from Seever 1957): Body-form limuloid; head concealed beneath very large pronotum, hypognathous; antennae inserted in deep fossae medial to eyes, their scapes resting in these fossae; antennae 10- or 11-segmented, their second and third segments small, the fourth to terminal segment forming a compact club; pronotum approximately twice as broad as long, its sides and apex continuously arcuate; pronotal hypomera very large, but not visible from the side; elytra broad, their epipleura very large; prosternum keeled; mesocoxae set in margined acetabula, narrowly or broadly separated; hind coxae broad, produced laterally to meet elongated metepimera; tarsi 4, 5, 5-segmented; abdomen acuminate; aedeagus typically aleocharine in structure.